Tonight a quick update on the basement project. We actually have not done much since I last wrote about the electrical in June. Everything passed inspection so far – electrical, framing, insulation. Next up is drywall. I decided that I would just hire a drywall contractor to do the basement drywall. My time is better spent working, and a contractor is going to do a better job than me anyway. Because the house is done, there’s no way to get really long 12′ sheets of drywall into the basement so we’re using 4’x8′ sheets. We’re using USB Ultralight weight 1/2″ sheets. 58 regular white ones, and 8 green mold resistant green ones for our 900′ square foot basement. Cost was around $700 for materials and truck rental. Our ceilings in the basement are 9′, but we’ll lose some height with the drop ceiling. To make up the rest of the difference between the ceiling height and the 8′ tall sheets, we’re going to install 10″ tall baseboard trim. We are worried about flooding in the basement, if the sump pump ever failed during a storm. We were originally going to install cement board on the lower foot so that if the basement flooded, we wouldn’t have to rip out the drywall. Well our drywall contractor came up with a better idea. We’ll paint the baseboard all around, front and back, to create a water-resistant seal. The baseboard will then cover up the bottom 8″ below the where the drywall ends. We’ll fir it out a 1/2″ so the baseboard overlaps the drywall. Then if it ever gets wet down there we can simply unscrew the baseboard and throw it out if it’s ruined, or remove it before it gets too wet. I need to talk to my trim carpenter to see if using MDF or hardwood is preferred for the baseboard. It should be a pretty neat trick. And the tall baseboard will fit in with the contemporary feel of the rest of the house. I went to Home Depot and picked up the drywall material. I was able to rent their truck and get it unloaded in an hour. Next week we start installing drywall so I’ll share more updates then. 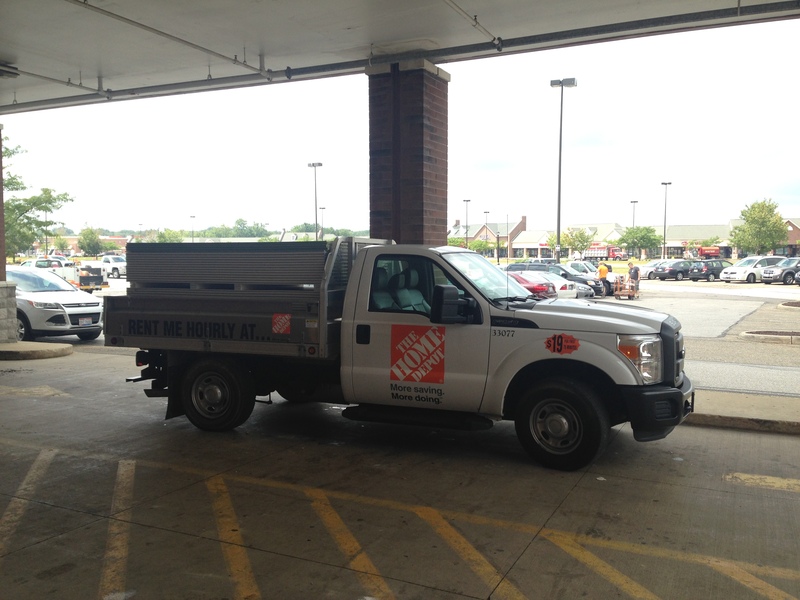 My rental truck with all our drywall loaded and ready to go home.